Perhaps the most obvious of these to any visitor to the town is the Cross erected beside the road on West Green. This memorial was carved from local sandstone by George William Brotton of Bilsdale and unveiled on Wednesday 5th October 1921. Bronze plaques on the east and west faces of the plinth record the names of men who died in the Great War of 1914-18. 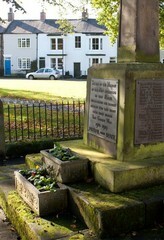 On the south face is a dedication to the Fallen of the Parish during the conflict, shown in the photograph on the left. Forty-three of their names are listed on the two plaques. 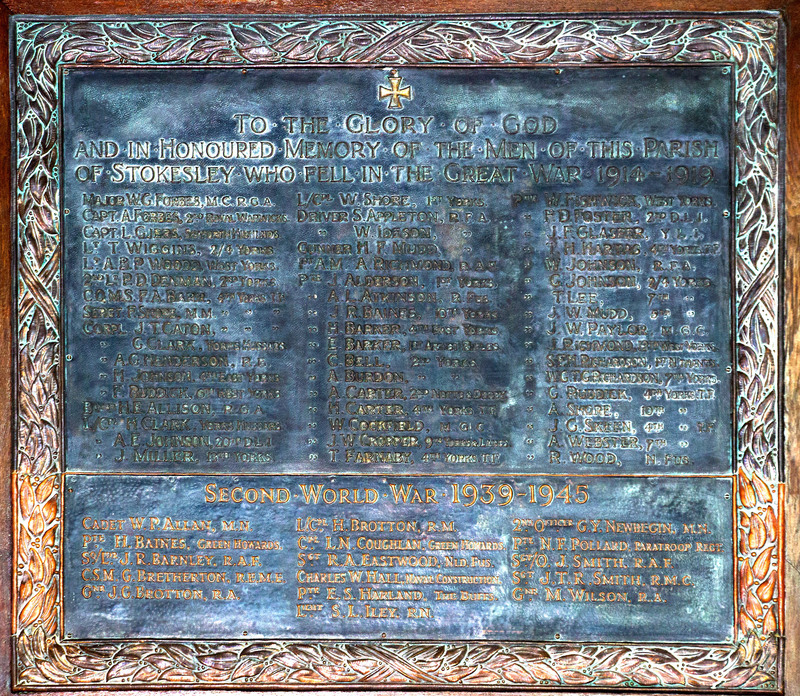 On the north face of the cross itself, another plaque records that the names of the dead of World War II (of whom there are thirteen) were added to the memorial "by the people of Stokesley" in 1947. These names are recorded on a plaque beneath, on the north face of the plinth. The photograph on the right shows the plaque on the west face of the War Memorial which records the names of the officers and NCO's of Stokesley who died in World War 1 in order of rank, and of the first two privates in alphabetical order. 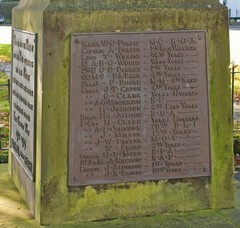 The memorial gives the name, rank, regiments and any Military Decoration of each of the men listed, but no further details. This reflects the the general sentiment of the time that the names of the Fallen should not be forgotten, and it is more than a little sad to think that even those who pause to read the names will learn little else. Unfortunately it would seem that there are inaccuracies and mistakes in even these sparse details. 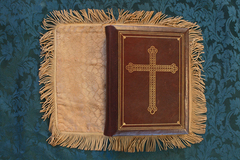 Another memorial is a bronze plaque in the Parish Church, (shown left) unveiled and dedicated on Wednesday December 8th, 1920. Interestingly, these two memorials (on West Green and in the Parish Church) do not agree in the details given of the men each commemorates. 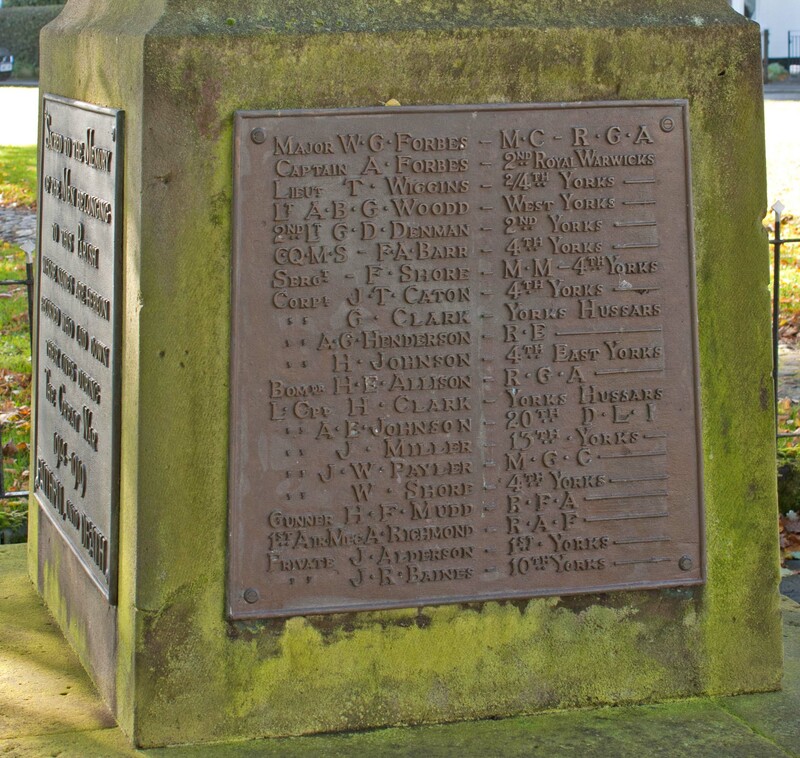 The Church Memorial lists more names overall, and includes young men from outlying areas such as Newby who are not mentioned on the West Green War Memorial. 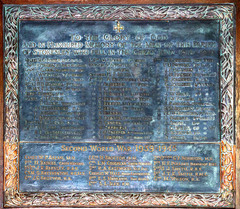 The West Green War Memorial differs in several instances (including names, initials and regiments) from the Church memorial. Most notably, 'Private J Barritt' is named on the West Green Memorial, but his name does not appear on the church plaque. 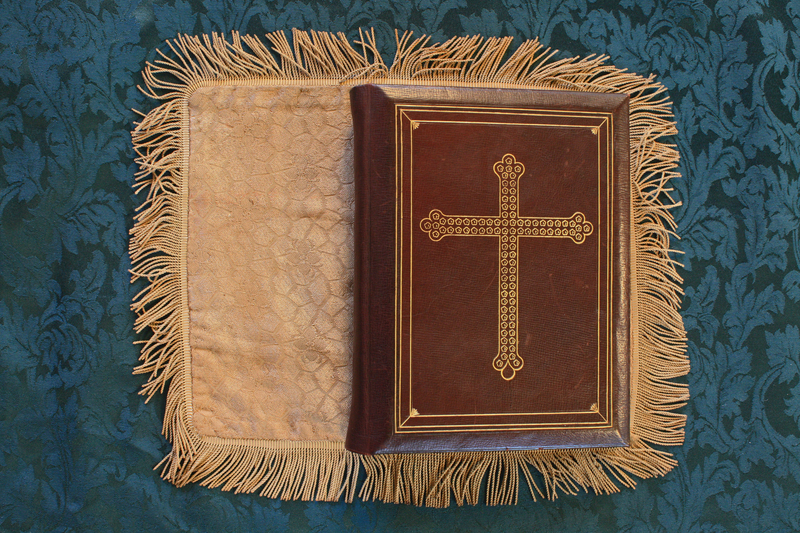 In general, where discrepancies occur, it seems to be the church memorial which is the more reliable witness to the facts! The fourth memorial was pointed out to us at the beginning of 2014 by Beryl Turner whose own work in the field of Local History is well-known in the town. 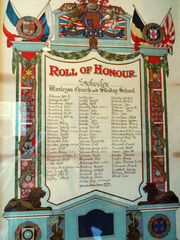 Shown left, this takes the form of a Roll of Honour in the Vestry Room of the Methodist Church on Stokesley High Street. This is a scroll which records the names of local Methodists who served in the Great War, and includes many men from outside the township itself. Some names are accompanied by a brief note as to what happened to the men in question. 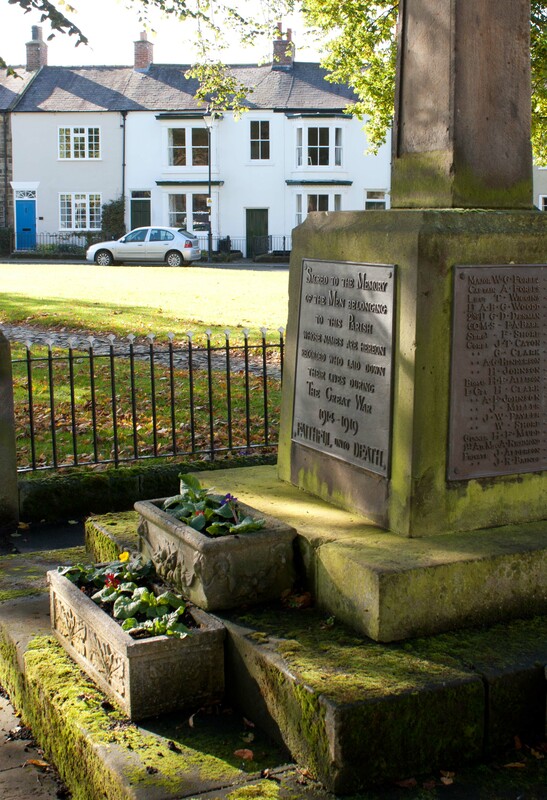 With the Centenary of the outbreak of the Great War approaching, there are virtually no residents of Stokesley who can themselves recall the lives of the Fallen, and there is a danger that it may be believed that these memorials tell all that is to be known of the men it records. The Heritage Website will attempt to redress this. Information is presented on each of the Fallen. 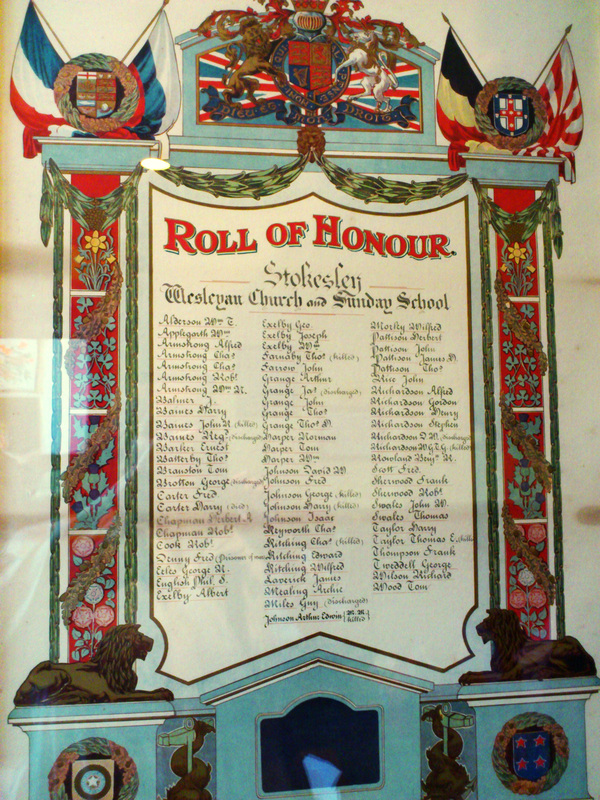 Some of this is drawn from the Book of Remembrance, (the text of which can also be seen in the town library, in a blue file, as part of the work done by the Stokesley Local History Study Group). However, the current research includes information from civil and military records (where they remain extant) as well as from local newspapers. Our endeavour is to show the Fallen as living men known to our town, and not merely as names cast in bronze. (CLICK on any image on this page to enlarge it. Use your browser BACK ARROW to return to the original page). 1. A message from Alan Swales, Stokesley born but now living in Great Broughton, tells us about the fifth! Thanks Alan. We are always pleased to hear more about the town's heritage. Click on the following link to see what he has to say: A neglected memorial?